Nothing will put you in the holiday spirit quicker than a festive holiday mani - a red holiday mani to be exact. 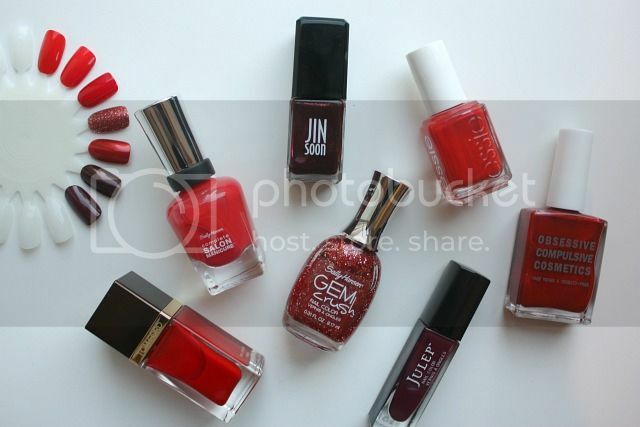 Bright, classic, glittery or dark - red nails are the perfect finishing touch for this time of year. As one who doesn't always gravitate towards these shades normally, I find myself reaching for them over and over during the Christmas season. I searched through my collection to pull out some of my favorite shades that are sure to get your fingers (and probably you too) in the spirit. If I have worn them in a previous Sunday Nailday post, I will link to the swatch. 3. Tom Ford "Carnal Red"
5. Obsessive Compulsive Cosmetics "Lustgarten"
Gorgeous red! I love red nail colors. Cha-ching looks like the perfect red for this coming Christmas. Carnal Red is true perfection I have to say. Geranium looks lovely! I like OPI's Big Apple Red.